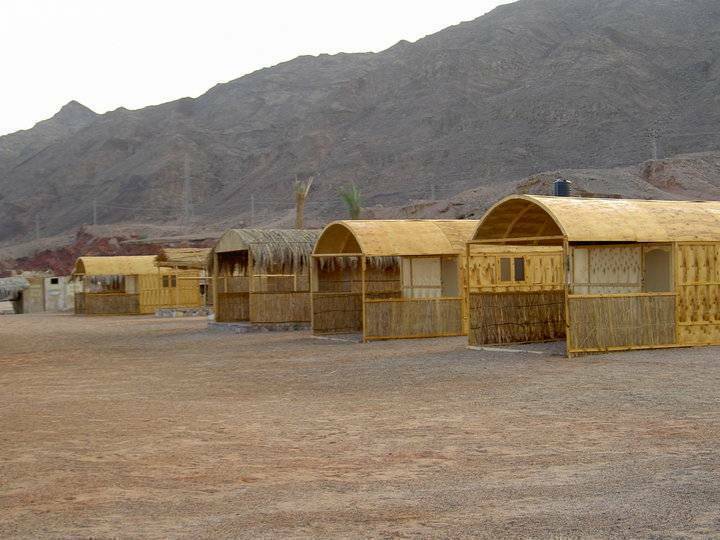 Barracuda camp is set 5km outside Nuweiba, on the Taba Road, South Sinai. Situated directly on the beach, the small bungalows are built from wood and palm leaves which are positioned around the camp. The shower and toilet facilities are of very good standard. Barracuda camp consists of a very good restaurant which has an expansive menu from Egyptian food to English;(watch them make the Bedouin bread, have a go yourself, we will let you), also fresh fish can be served daily (mainly caught by the neighboring fisherman or even by the family or staff), anything that you require we will be only too pleased to try and accommodate. From the beach there are two reefs which are excellent for snorkeling, where you can see a variety of colourful fish and coral. If you feel a little nervous, no problems someone will snorkel with you. The camp is owned by a friendly family man, named Sulman who speaks very good English, also there is an English lady that is based at the camp who will be only too pleased to help with anything. Barracuda is a peaceful quiet camp ideal to relax in. The scenic view of the mountains behind and looking across the red sea is a beautiful site to take in. The bathrooms are situated close to all the bungalows; they consist of two seperate amentities for both male and female , both have two showering facilities and 3 wc's in each, with hand basins and mirrors, and are always kept immacuately clean. The view to the right is some of the 20 Bunglows set on the beach, as the sun is setting over the red sea. Just one of the beautiful sunsets in Sinai. The restaurant/cafeteria is open all day for snacks and refreshments, Breakfast is included with all bookings, unless otherwise agreed. Meals from our expansive menu available sometimes pre-bookable according to your choice. VEGETARIAN SPECIALITIES AVAILABLE ON REQUEST! Nuweiba is located 70 km south of Taba and 180 km north of Sharm el Sheikh and only 110 km from Saint Katherine. Nuweiba means, “bubbling springs” in Arabic and it is one of the big oases in South Sinai. The 7-km long stretched settlement developed from a barren isolated place with no infrastructure into a promising and attractive tourist destination. Nuweiba is just recently discovered by tourist investors establishing hotels along the coastline south and north of Nuweiba, connecting it with Taba in the north and Dahab in the south. the northern part, consists of a thick grove of palms, a shallow bay and the ruins of a Turkish fort. The well inside the ruins has served the Bedouins as a fresh water source for centuries. In the early 80s the process of settling started, when families of the Tarabin tribe who occupy the area north of Nuweiba permanently moved to live in their summer location. 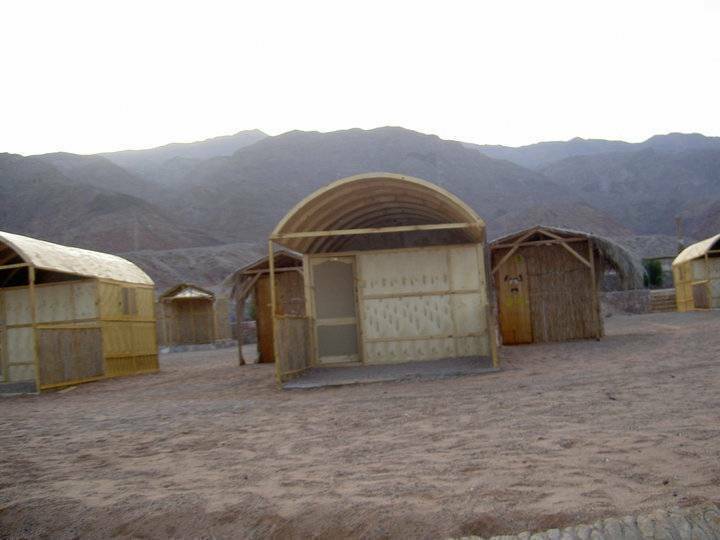 At this time the Bedouins set up the first simple accommodation made of scrap wood and metal - the only materials available - rooms for travelers. With an increase in tourism and an improving infrastructure soon many campsites and small hotels sprouted like mushrooms along the bay. Tarabin is known for its lively oriental atmosphere. Restaurant by restaurant and bazaar next to bazaar gives you the impression of a colorful oriental market place. 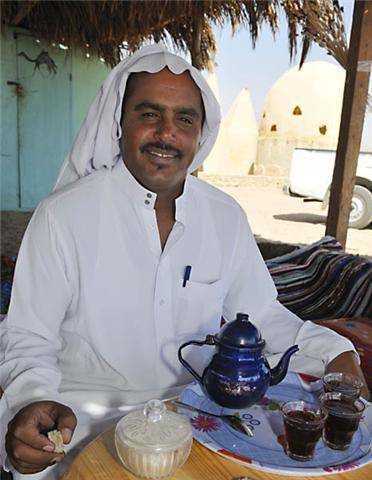 Along the beach you find lively outdoors restaurants furnished in Bedouin style with carpets and cushions that invite to lay back and relax and let the time pass by. The Town is built around the former Moshav Neviot, which was established during Israeli occupation in 1971. Its significance lies in marking the tribal boundary between the Tarabin tribe in the north and the Muzeina tribe in the south. Up to now Bedouin tribes of the area respect tribal territories. Nuweiba Town is frequently visited by travelers. It is the center for the tourist places: the “Dunes” in the south and Tarabin in the north. The only bank in Nuwieba Town is found at the Domina Hotel. A new commercial area opposite the Domina is in development. Some restaurants and supermarkets are already operating. Opposite the small commercial center lies the public bakery that provides you from early morning until midday with fresh pitta bread. A little path leads you to the Post Office: open from 9. 00 to 14. 00 except Fridays and on holidays, and to the 24-hours opened Telephone Communication Center, the “Centraal”, from where you buy your telephone cards. Separated through a little park lies the veteran center of Nuweiba with supermarkets, bazaars and vegetable shops. or also known as 'Nuweiba Mina' is the industrial area. With the construction of the port in 1985 trade business between Egypt and the Arab countries on the other side of the Gulf of Aqaba increased. 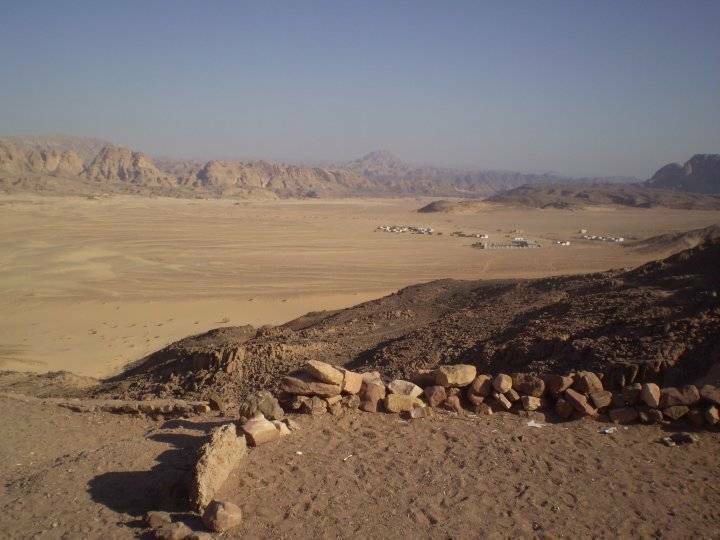 A highway was built through the mountains connecting mainland Egypt with the Sinai Peninsula. 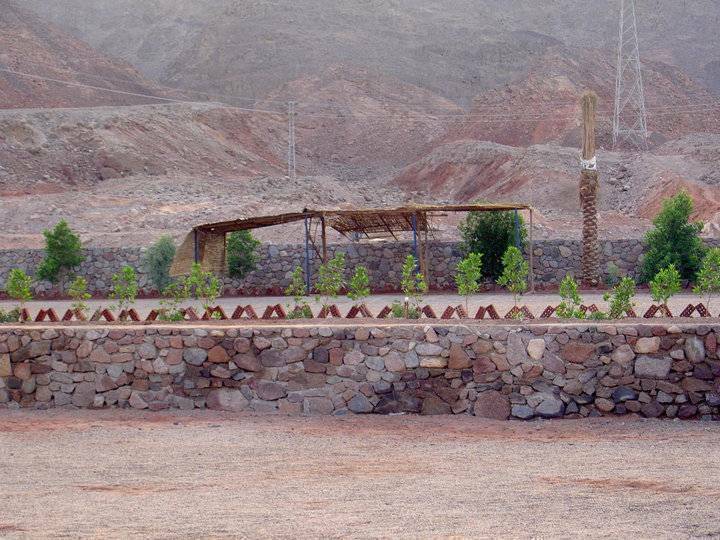 Egyptians from all over the country came to live in Nuweiba as work flourished. Homes and schools were built, shops and business centers opened and the first hotels were established. Originally Nuweiba port was the summer location for the Muzeina tribe. It was a sparsely inhabited oasis, which came only into life in the late summer, when the Muzeina flocked to the palm groves to pick dates. The thriving trade encouraged the Muzeina clan to settle. They are running their own businesses by renting out their places as shops or other facilities to the Egyptian newcomers. Here you can provide yourself with some goodies out of the Duty Free. Several Banks to cash your checks or credit cards at one of the ATM machines are close to the port's entrance and so is the ticket-office where you can purchase your tickets for the ferry to Aqaba, Jordan. However, “Al Mina” is as any common port area scattered with shops and supermarkets. Yet, it is here that you find a good bargain for commodities not available in Nuweiba Town - and of course in the restaurants you find good and cheap local food. Mozina is the home of those bedouins from the "Mozina" tribe who finally settled down from their originally nomadic life. The village is sometimes called "fishermen's village" as most of the locals have to fish to get food for their families. In Mozina you find some small supermarkets, a mosque and typical bedouin houses. Often you find wild camels grazing around and huge groups of goats and sheep. 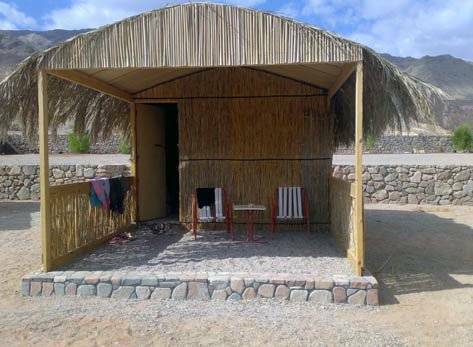 Barracuda camp is set 5km outside Nuweiba, on the Taba Road, South Sinai.